Maine Outdoor Brands (MOB) is an alliance of like-minded business leaders and entrepreneurs started in 2017 and has grown to more than 80 members. MOB represents an $8.2 billion outdoor recreation economy in Maine. While MITC and MOB partnered in the past at the Outdoor Retailer trade show in the US, OutDoor Europe in Friedrichshafen, Germany in June 2018 was our first collaboration at an overseas trade show. 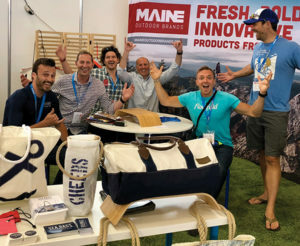 With financial support from the US Small Business Administration’s State Trade Expansion Program (STEP) grant, MITC and MOB organized a shared booth for five Maine companies, exhibiting internationally for the first time: Good To-Go, Blaze Partners, Sea Bags, Flowfold, and Threlked Photography. In addition, the exhibiting companies participated in Gold Key Service pre-scheduled, one-on-one appointments with international buyers, agents, and distributors during the show, arranged by the US Commercial Service in Munich.